Up until two nights ago, there have been multiple direct paths between our interior living space and the outdoors. For some areas, such as the first floor ceilings (open to the eave vents) we’ve simply stapled up plastic to hold in the air. For the second floor, we are in the middle of actual retrofit work and have to take things in order. Two bays aren’t insulated in that picture. The final bay, where the knee wall intersects the end wall, will be insulated after we add shear bracing to the end wall (yes, we’re bracing everything). The half bay that isn’t insulated will eventually be cut out to become our front attic access. Our house has four separate attic spaces that will be insulated with blown-in cellulose, and each needs their own seal-able access panel. We will try our best to disguise them in the final detail work. At the back of the house, we in-filled the attic bays on either side of the dormer with foam, and then added OSB to the attic portion of the dormer sides. Both sides of the dormer also had two stud bays headered off. These are going to form built-in book cases on each side right next to the window seat by the dormer window. The backs of the bookcases will have concealed access panels to get into the attic space on each side. 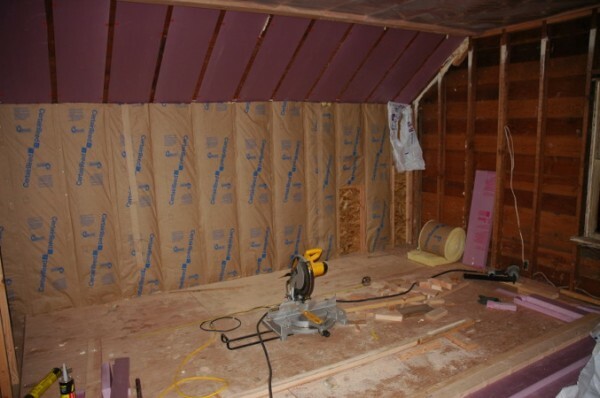 The attic portion of the dormer walls will be insulated with 4″ foam much later. For now, we’re just relying on the OSB and stapled in plastic to hold in the heat. Note that the headers are only half finished. I ran out of 2×6, and I also want to get some 1/2″ foam to make a laminated header to reduce thermal bridging. The foam insulated bypasses had some gaps where things didn’t fit together real well, so we filled these with spray foam and then had to trim off the excess with a flush-cut saw. Spray foam is obnoxious to work with (and spendy), but it gets the job done and provides R-6 per inch. 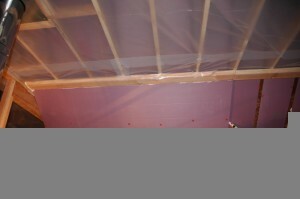 Next, we started adding the “real” insulation for the angled ceiling areas. This is formed by 2″ thick 8′ foam panels that are cut to fit tightly against the double stud plate above and come down to the knee wall. The first step in installing these is to caulk more of the bypass gaps, and also apply a ring of caulk to each bypass panel to seal it to the next layer. If the bypass panels do not adhere tightly to the next layer, then cold air will infiltrate between the layers and we’ll lose the insulating value of the outer layer. I’m using only siliconized latex caulk which has a significantly longer life than the plain latex variety. The beads of blue in the photo are PL300 foam adhesive. Once an area was caulked and adhesive applied, we held the foam panel in place and tacked it up with 3″ plastic cap roofing nails. Enough nails were applied to hold the layers together until the adhesives dried. Long term, these panels will also be held in place by the next layer of stud framing. I really hate these nails, as they bend at the slightest provocation. 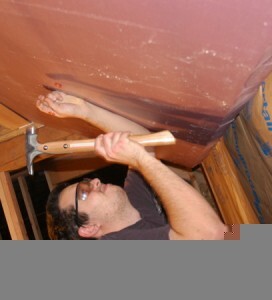 After installing a panel, we caulked the seams against the roof and framing in preparation for the next layer. So far four panels are up, (32′ linear feet). The rest have to wait until the end walls are sheathed. 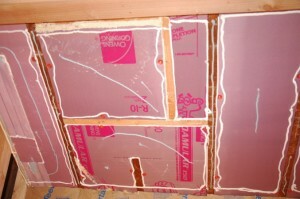 The remaining gaps between the roof and the double studs were closed in with stapled plastic to hold in the heat. This is the first time our house has been “closed in”, but it didn’t appear to make a huge difference with temperatures dropping to 12° for the last few nights. This weekend we’re supposed to have a 40° night, so we look forward to making ourselves uncomfortably warm for the first time in months. I like the idea of the backs of the bookcases that will have concealed access panels to get into the attic space – pretty neat idea! Your house will be so nice when you are done. And when you are done working on your house, you probably will not know what to do with your free time -you wont be used to not working on the house! Have a nice warm weekend! Well this explains the frozen olive oil. Wow! You guys are really redoing the whole place, aren’t you? I sure don’t envy you the job. Are you going to make the attics usable for storage or anything? Benita – Yes, it’s a big projects. Bigger than we planned for originally, but we have a “vision” for how things are going to be now and a general plan of attack. Despite my mother-in-law’s continuing complaints, we plan to fill the attic spaces only with blown-in insulation. In three places, there will be built-in cabinets that jut out into the attic areas (the two book cases described above and a flush media cabinet), but otherwise they will be sealed off. My theory is this: low headroom areas built under the eaves require just as much work to insulate and finish for considerably less value, and accessible storage areas will be hard to get to and be filled with things we probably shouldn’t keep anyway. Besides, we have plenty of outdoor storage in the barn and the to-be-rebuilt woodshed, if we need it.